We are now less than two weeks from arriving in Paris for the European Orchid Congress and Exhibition and the team at the Orchid Project are getting very excited. In part our excitement is due to the way that several of our really monster orchids have decided that they fancy a trip to Paris and have started to open their flowers. 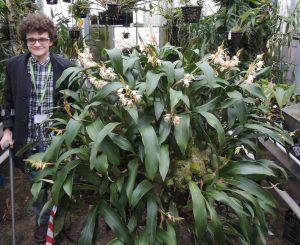 James seems very happy in the photo above as he surveys Coelogyne holochila which started to open flowers last week and will be in perfect condition for Paris. 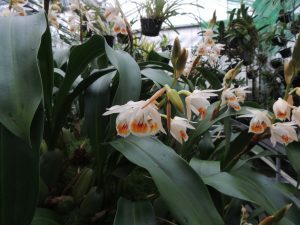 This species is a large grower with 10cm pseudobulbs each topped with two dark green leaves and a long flower spike of six to twelve large attractive flowers. The species is native to the Himalayas where it is reported from Nepal through Sikkim, Bhutan and Arunachal Pradesh through to Yunnan. 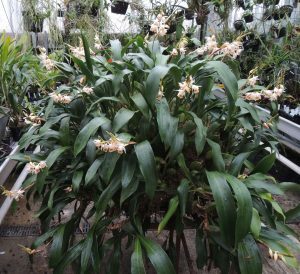 We have seen the species flowering in the tops of trees in wet evergreen forests at 2000m in Arunachal Pradesh and the closely related Coelogyne stricta in simillar forests. Specimens in the wild become really large plants enveloping sections of the trunk or main branches of large trees and our specimen at school has grown to a very large size since arriving as a single bulb in 1993. We grow the plant in Cool Asia (minimum 10C) and keep it well watered throughout the year especially in the summer. The plant now has a verdant layer of natural moss around the base of the pseudobulbs.